In February 2011, the municipal government of Rio de Janeiro began demolishing the Favela do Metrô, displacing almost 1,000 people.1 In its place, residents heard, the city would be building a parking garage for the nearby Maracanã Stadium, an epicenter of both the 2014 World Cup and the 2016 Olympics. The demolition is just one piece of a $450 million redevelopment plan for the area surrounding Maracanã. Photo Credit: Theresa Williamson/Catalytic CommunitiesThe evictions have sparked a backlash from Brazilian community groups, social movements, and human rights organizations. Groups such as the New York–based media-advocacy NGO Witness, the Rio-based Catalytic Communities, and its two-year-old offshoot Rio Olympics Neighborhood Watch (RioOnWatch) are using citizen-driven media to pressure those in power to act. By gathering and disseminating footage from community members, these organizations have documented the police’s use of excessive force during evictions, and the denial of the human right to housing to thousands of people. They have halted forced evictions, disseminated dozens of videos through social media sites and community screenings, and have made footage available to news outlets in order to mobilize activists and influence public policy.5 These actions are part of a larger video-advocacy movement that Witness defines as “an integrated tool in human rights campaigns.”6 Their goal is to blend the context and analysis of traditional media with the immediacy and ubiquity of citizen journalism in order to not only document, but prevent, human rights violations. Tiago Donato is a journalism student in Rio de Janeiro. He became involved with the movement against forced evictions in 2010, working with Catalytic Communities and RioOnWatch to conduct video production courses for low-income youth. In 2011, he began to collaborate with Witness by training community activists how to use video to advocate for human rights. The following interview took place June 28. Can you elaborate on the background of the forced evictions in Brazil? We have a lot of poverty in our city, right where they want to develop new infrastructure. And the main reason the city is initiating forced evictions now is for the transportation and infrastructure for sporting venues and parking for the Olympics and World Cup. They want to build a shopping center and a lot of parking around Maracanã Stadium. They are also working on building a bus rapid-transit system where there are a bunch of little favelas, and now the city is evicting everyone so it can finally widen these roads. There is a long history of marginalizing the people in favelas when it comes to development. Whenever the city wants to build a road, they do it in a favela rather than over middle-class condominiums. That said, Brazil—and Rio de Janeiro in particular—has certain squatter laws that protect people in the favelas, but our government is not upholding them. There are several different ways the city can compensate someone for having to leave their home. It can move them to a new home, but it needs to relocate them within four miles of their original location. Instead, the city is relocating them 25 to 40 miles away. If the city compensates someone monetarily, the amount should be sufficient to acquire a comparable house in the same area, but the city is paying much less. The government also justifies many housing evictions by saying that the areas are at risk of a landslide. We have sent engineers to certain communities, and they have confirmed that the hillsides could be reinforced instead of removing the houses. But the government always chooses to clear the area, even though it’s less expensive to reinforce the slopes than to compensate the communities for their houses. If you look at the map, almost always, the areas they say are at risk of landslides are the locations with the best views in the communities. You could knock out these communities and build a bunch of restaurants or hotels. How is video advocacy being used against forced evictions? About a year ago, Witness came to do work in Rio. They held an eight-day workshop they have conducted around the world—in Mexico, Cambodia, and other countries—with residents who are threatened or already removed, and other movement activists, to start a video advocacy network in Rio. We have just released our first extensive video project that we have been working on for six months, called We Are the Legacy: The Story of Elisângela. It is the story of a woman who was removed from a community in the south of Rio called Morro do Pavão—Pavãozinho. She still hasn’t received any kind of compensation from the government, and she is separated from her daughter who is living with other family until Elisângela finds a new home. There is a lot to tell in that kind of situation, and we aim to do more of these types of videos. Before that, we had other projects that were triggered by specific events, such as when the International Olympic Committee officials visited Rio de Janeiro in November 2011. 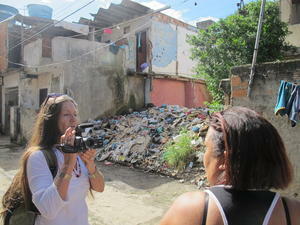 We documented the work of Antonieta, a former resident of the community Campinho, which is now completely demolished. She and other activists interrupted an official Olympic Committee visit to one of Rio’s favelas. They handed out DVDs and pamphlets and talked about forced evictions and how the Olympics are affecting communities in Rio. After the video on her protest went viral with about 13,500 views on YouTube, we believe the International Olympic Committee told the government, Look, you have to get your act together because you are making us look bad. Before that, there had been some really horrible evictions in Campinho at the end of 2010. Residents were removing their things from inside their homes at night when the government shut down power, so they didn’t have light to work with. One night the crews were bulldozing homes until one in the morning, even though the law specifically says evictions cannot go on at night. Another part of the law states that evictions cannot happen in the middle of the school year, but that is exactly what happened to Elisângela’s daughter. Their house was torn down and they had to move away. Her daughter missed so much school that she had to drop out for a whole year. The law says you can’t do that, but they are doing it. Now you don’t see that sort of thing anymore. The city has kind of gotten its act together and is working more subtly. Has video advocacy been used to stop forced evictions? In the community of Taboinha in late 2010, the police had fired tear gas and rubber bullets at the crowd of residents who were trying to block the entrance to the community because the government wanted to come in and knock down houses. The next day, two video activists went back, and when they pulled out their cameras, the driver of the bulldozer turned the vehicle off and left. Then the police approached and started giving them trouble, asking, “What are you doing here? Why are you filming?” The police said they had to hand over their equipment. While this was happening, some residents arrived with their camera phones. Just as the video activists had stopped the bulldozer, the residents used their camera phones to stop the police from interfering with the activists. Who are you trying to reach with your advocacy, and how do you disseminate your work? We work to have a very extensive strategy of dissemination. When each video comes out, we try to already have a screening set up with the City Council, hopefully with a member who is connected to the forced evictions issue who can help us. Alternatively, we have screenings at state assemblies and other communities. We have screenings wherever we can, together with releasing the videos on YouTube and promoting them on Facebook. We also use the activist community, which is more likely to help spread our videos and our work. For example, [the news agency] A Pública from São Paulo wrote a report on our video about Elisângela. They found it on Facebook or on one of our activist networks, and they published it on the front page of their website as their own story, but we provided the picture, the video, and access to the resident in the video. Their story, in turn, got republished on The Huffington Post. What is your relationship with the mainstream media? Catalytic Communities originally created RioOnWatch to serve as a source for traditional journalists to get their information directly from residents and activists. That is the same thing we want to do at Witness. If anyone contacts us from traditional media, we will assist them in writing a report, we’ll give them all the photographs they want. Like WikiLeaks, we encourage big newspapers to write something about our work rather than limiting ourselves to only posting our work on YouTube. How is the work that you are doing different from traditional media? I have a journalistic background, but video advocacy is different. Take this video we just finished, We Are the Legacy. It took us six months to make. This was an intense learning experience for me, because the movie not only needed to move but also to inform the audience. It also had to be really solid. We couldn’t have any holes in our story. At the same time, I wanted it to be powerful. You need to touch your audience. You need to move your audience. But you also need to get them to act, with a link at the end of the video that the person can click to learn how to get involved. At Witness they ask, “Why are we making this video? What do we want our viewers to do at the end of the video? How will we do that?” That is something that I am still learning. I want to get to people—like my own mother—who are part of middle-class families and often have predetermined opinions on the subject of evictions and probably have never been to a favela. The Elisângela video is a combination of journalism and advocacy, and we had to make our story really complete, with an emotional narrative. The rest happens outside the video with the website campaign. We don’t expect 100,000 people to see every video. Maybe only two people will see it, but those are two people who can make a difference. Kyle Barron is a graduate student in comparative politics at New York University. She is researching the intersection of politics and new media. 1. Tom Phillips, “Rio World Cup Demolitions Leave Favela Families Trapped in Ghost Town,” The Guardian (London), April 26, 2011, available at guardian.co.uk; Tom Phillips, “Pushed Aside: Families Make Way for 2014 World Cup,” The Guardian, April 27, 2011. 2. Felicity Clarke, “Favelo do Metrô Terrorized Through Drawn-out Eviction,” RioOnWatch, May 9, 21012, available at rioonwatch.org. 4. Andressa Caldas and Thiago Hoshino, “Universal Periodic Review: June 2012—Brazil, November 28, 2011,” available at lib.ohchr.org. 5. Simon Romero, “Slum Dwellers Are Defying Brazil’s Grand Design for Olympics,” The New York Times, March 5, 2012; Sam Faigen, “Media Presence Halts Demolitions in Vila Taboinha,” RioOnWatch, November 15, 2010, available at rioonwatch.org. 6. Witness, “Our Mission,” webpage, available at witness.org.